I’m beginning to feel like the legend that was Bruce Forsyth, when he used to tell every couple on Strictly Come Dancing that they were his favourite… because every month I say the same thing. THIS BakedIn Baking Club recipe is my favourite. Well, at least until September’s arrives anyway! In case this is your first visit to my blog, let me tell you about this Baking Club. Every month they send you all the dry ingredients you need as well as extra bits and pieces such as baking paper and testing skewers, to make a scrumptious recipe created exclusively for BakedIn with Michel Roux’s approval. There is always a handy tip included on the recipe card which suggests a way to make the recipe extra special. The recipe card tells you exactly what is included in the box, what extra ingredients you will need, and has clear instructions and photographs for each step of the recipe. All of the dry ingredients are weighed out for you so you can get on with the fun part of baking without so much preparation. The card does tell you though how much of each dry ingredient there is so that you can make the recipe again in the future. I love that detail! I used to receive a subscription box that gave you a recipe and the spices needed to make amazing curries. The recipes were fantastic. 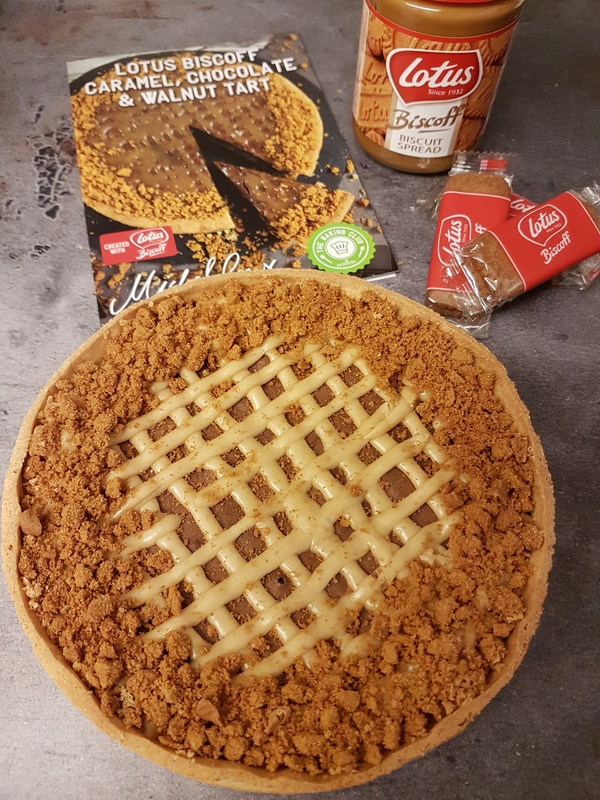 The only problem was they didn’t tell you how much of all of the included ingredients there were, so it was impossible to make the recipe again without buying the whole kit again! I love that BakedIn aren’t like that. They WANT you to make their recipes time and time again and they want to get everyone baking! These recipes are perfect for baking with children too, so make brilliant quality family time. Plus of course you’ll have a wonderful time eating them. 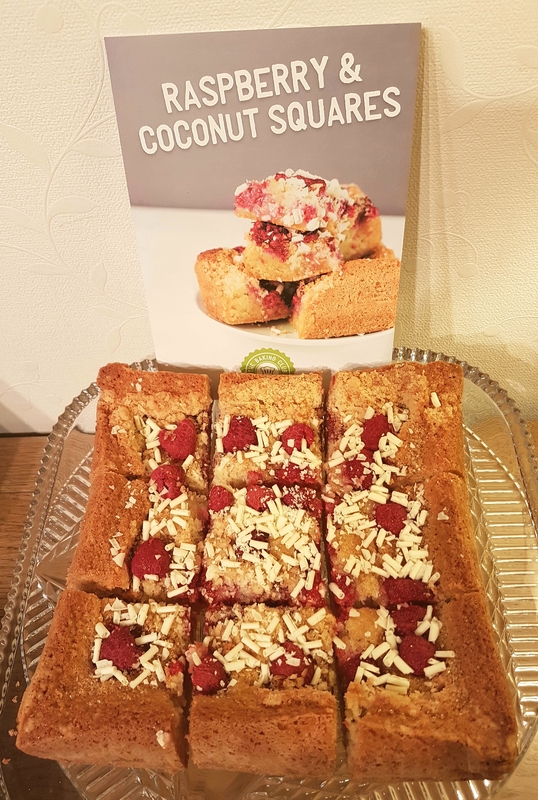 The Raspberry and Coconut Squares recipe was absolutely scrumptious. It had a delicious almond base which had a gorgeous crispy crust. It reminded me a bit of suet pastry puddings, although much much nicer, and no suet. This base was topped with fresh raspberries, a coconut crumble-type layer, another layer of raspberries, and finally topped with white chocolate curls after it had cooled. 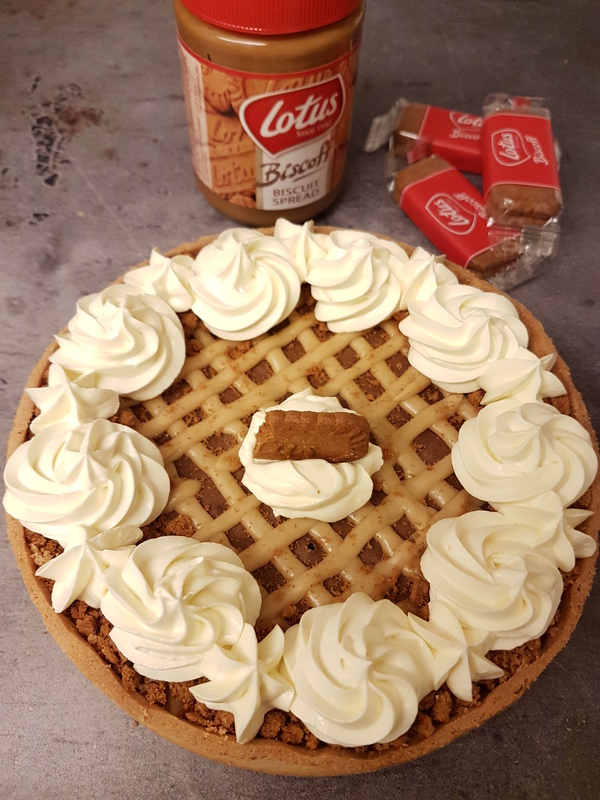 It was supposed to be cut into 12 squares, but as I frequently get accused of being a “feeder” I decided to live up to the accusations and cut it into 9 larger squares 😀 We enjoyed it with ice cream one day and custard the next, and each time it was heavenly. Definitely one to make over and over again. It was comfort food at it’s best and we’ll be enjoying this one a lot during the Winter months, warmed up with custard. If you are interested in joining the Baking Club, just click HERE to go to their website to find out more. It costs just £8 a month including delivery (even less if you pay for a few months in one go). Although at the moment when you first visit the link you will get a chance to sign up to their mailing list and receive your first box for just £3.99! That’s an offer you can’t refuse. Happy Baking! I know that I say the same thing every month…. 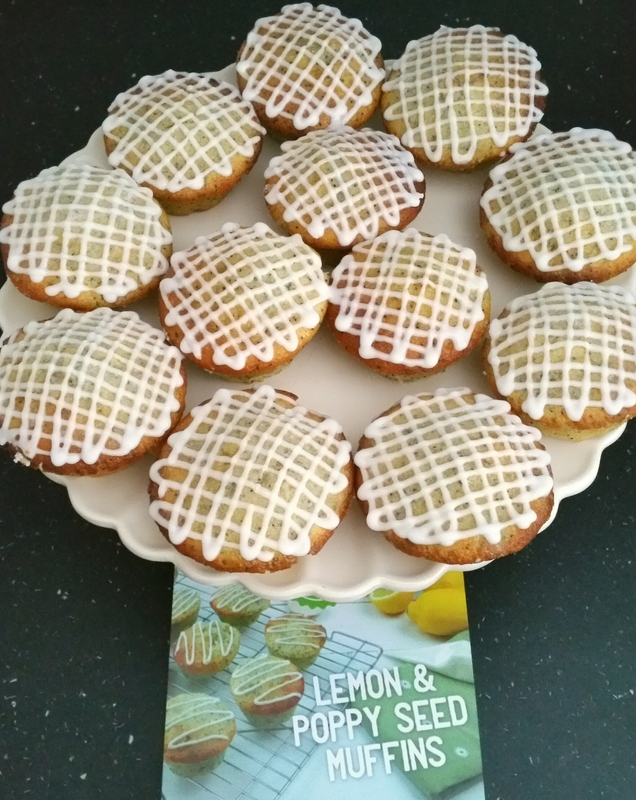 “This month’s BakedIn Baking Club recipe is the best ever!” I apologise in advance but I’m saying it again for June’s! I absolutely adore all things cinnamon and pecans are my very favourite nut, so I was really excited when I opened June’s box and saw that it contained both ingredients. I instantly knew that this was going to be amazing. In fact, it was so amazing I made it straight away, and the day after the last slice had been eaten I made it again! 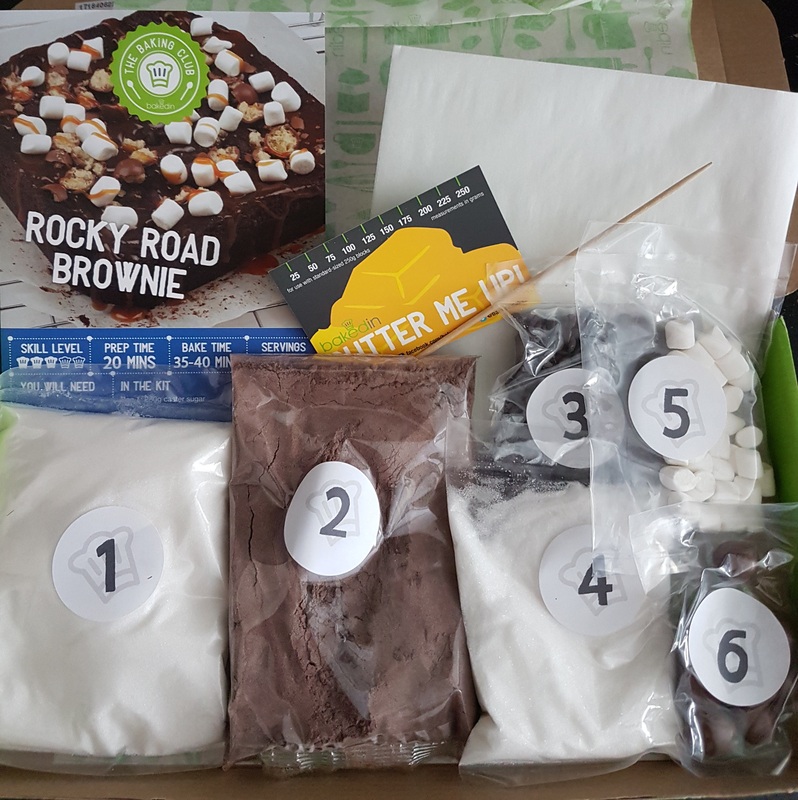 Regular readers of my blog will know that BakedIn Baking Club is a monthly subscription service that sends all the dry ingredients needed to make a wonderful recipe from the world-renowned chef Michel Roux. This month’s box also contained baking paper, a butter measure, and a skewer to test when the loaf was ready. There was also a yummy chocolate from Rising Star Games to promote their new Cooking Mama Sweet Shop game, with a £5 off discount code to use at their online shop. The recipe card for this loaf was very easy to follow. 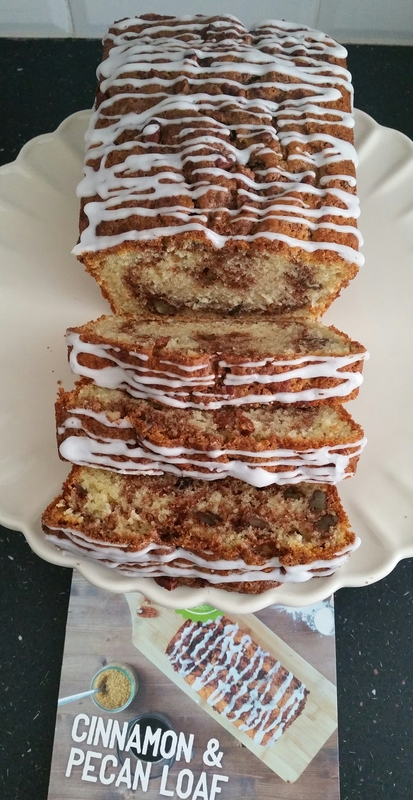 There is always a top tip from Michel Roux to make sure your bake is the best it can be, and this month’s was to swirl the mixture in the loaf pan more than you’d think you needed to in order to get a lovely cinnamon marbling effect. This was definitely a top tip! I swirled and swirled mine to the point where I thought my loaf was going to end up just brown, but I actually think it could possibly have done with a bit more swirling! This loaf was absolutely delicious on it’s own, but since my holiday in America last year where I discovered how good cream cheese icing is with anything cinnamon, I decided to spread some of the icing on a slice, just like spreading butter. Oh my word…. that was a scrummy addition which made it even more indulgent! 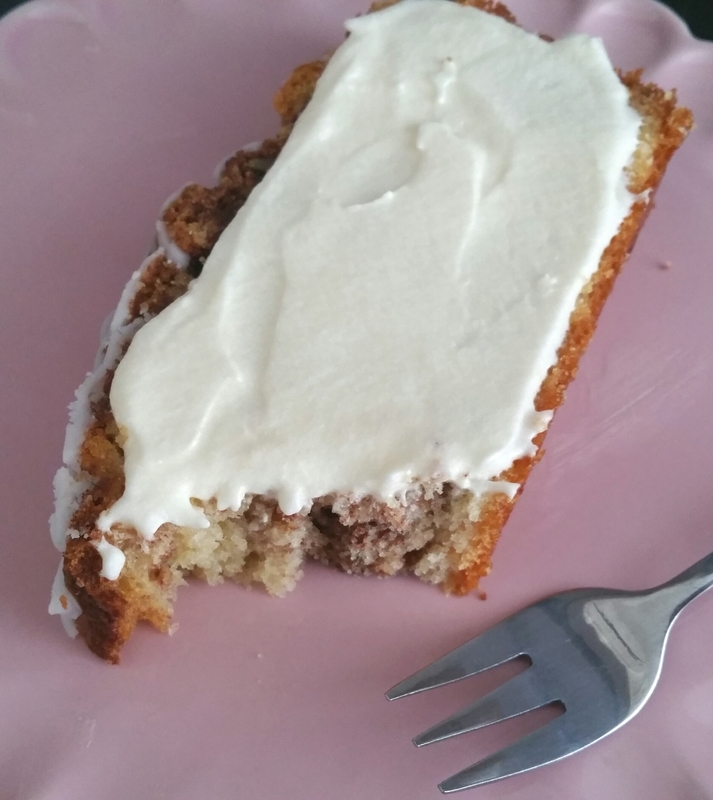 (The recipe to my cream cheese icing can be found HERE and I’d recommend it for any sweet cinnamon bakes). 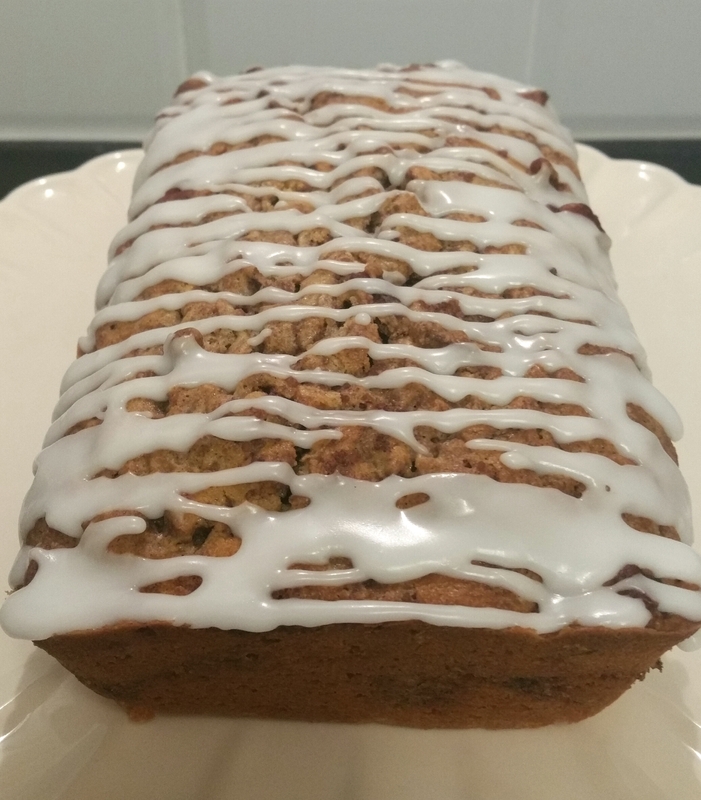 I’ve made loaf cakes plenty of times before in different flavours, but can honestly say this cinnamon and pecan loaf is the best loaf cake I have ever tasted. It was so easy to make, and the end result was just incredible. It had the perfect amount of cinnamon and the pecans gave it a beautiful crunch and extra flavour. This will be made time and time again! That is one of the great things about the Baking Club. The recipe cards tell you exactly how much of all the dry ingredients are included, so you can make it again at a later date. The card is also wipe-clean so you can easily wipe any splashes off it. (I’m a messy baker and always end up with splashes of mixture and clouds of flour and icing all over everything). If you would like to join the BakedIn Baking Club, click HERE to go to their website. It costs just £8 per month if you pay monthly, or you can buy a 3 month subscription for £22 which equates to £7.33 per month, or a 6 month subscription for £42 which equates to £7 per box. All of the options include free delivery, making them brilliant value! You can also buy gift subscriptions. I personally think a gift subscription is the perfect present for so many occasions: housewarming, newly-weds, thank you gift, birthdays… anything! Anyone would be lucky to receive this. DISCLAIMER: I pay fully for my subscription and am not asked to write a review for the Baking Club. I get no compensation if you join it too, I write these reviews purely because I love this Club so much. I only recommend products or services I genuinely like. Honesty is the heart of my blog. I love the middle of the month. 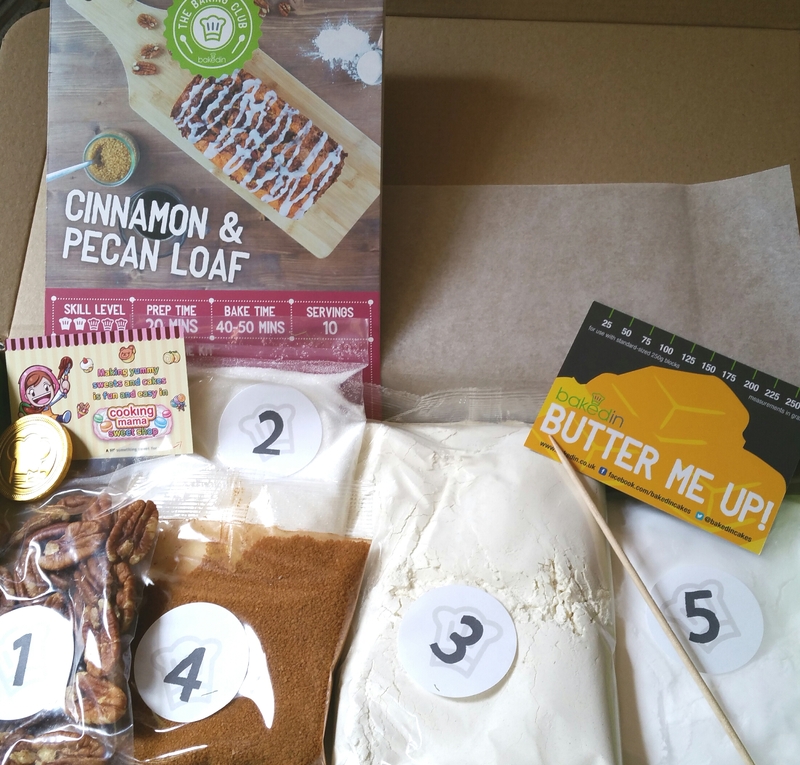 It’s when my BakedIn Baking Club subscription box lands on my doormat! The excitement as I hear the thud as it lands, the sight of the lovely bright green box, the anticipation of what might be inside this month, and then the satisfaction of being able to make something I might not normally bake, and finally the joy of eating it. Yes, I definitely love the middle of the month. The May box was a perfect Spring box. I always think of lemons as Spring and Summer fruits, even though they’re not. It’s just that this is when I most enjoy them and find them most refreshing in recipes. 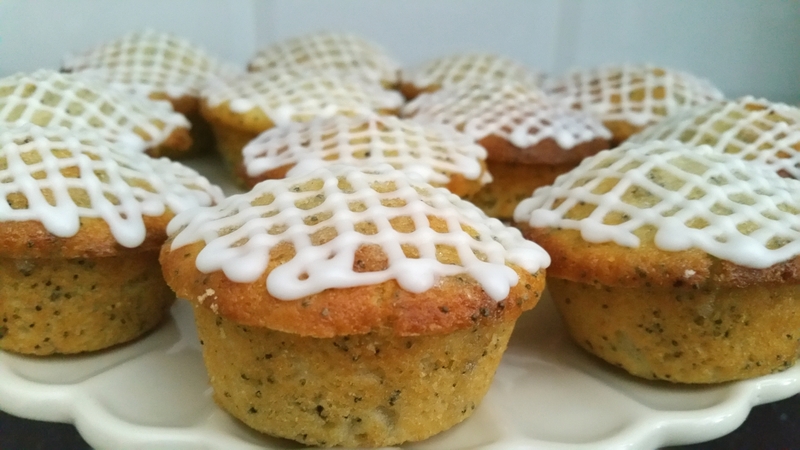 This lemon and poppy seed muffin recipe called for 3 lemons, so I knew I was going to love it! I already have a go-to recipe for lemon drizzle cakes (THIS ONE) so I was intrigued to see how much the BakedIn recipe would vary. Obviously the fact they were muffins meant they would probably be denser than light cupcakes, but only slightly. I was actually surprised at how light these muffins were! The poppy seeds added a lovely texture and broke up the lemon taste beautifully. Luckily Tesco is a stone’s throw away from my house so off I popped to get more lemons. After greasing the pan the way the recipe said this time, I made another batch of these muffins and they came out perfectly! The lemon fragrance as they were baking was so beautiful. There are some baking smells more than others that I wish could be bottled up and sold as air fresheners. The smell from these muffins was one of those. So inviting. My usual lemon drizzle recipe involves the baked, still warm cakes having a lemon syrup poured over them so it soaks in. This muffin recipe made a lovely crunchy syrup to pour on, and that was so good. The icing to pipe on top was the same as I am used to making. I really loved all the textures in these muffins; the lightness of the actual cake, with the crunchiness of the seeds and the sugary topping. It all resulted in a match made in heaven. And sadly, as with all BakedIn bakes so far, these didn’t last long. 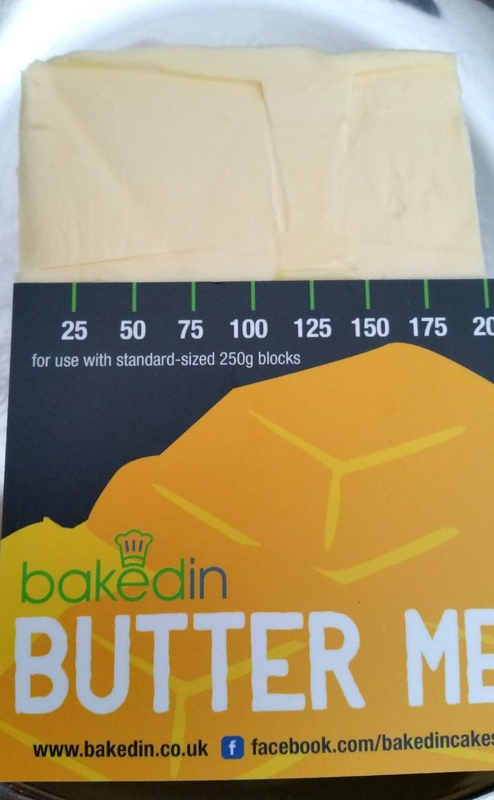 Fortunately though BakedIn make sure they give you all the measurements on the recipe card so you can make them again in the future. I’ll definitely be making more of these. I have some oranges begging to be used up too so I might try orange and poppy seed ones. All the dry ingredients come already weighed out for convenience. If part of the recipe requires a few dry ingredients to be added at the same time, then those ingredients are placed together in one packet. There is always a very clear recipe card with photos of every step so you can see you’re on the right track. Michel Roux adds a Top Tip to either help with a tricky part of the bake or to suggest ways to enhance it even further. As well as the dry ingredients you always get a butter measure, and in this box there was also a skewer to test when the muffins were ready, and a disposable piping bag for the icing to decorate. Obviously they can’t send things like eggs and butter as they would be a logistical nightmare to keep chilled and whole, but they always tell you in advance what you will need to buy yourself. Sometimes you get a little treat added to the box, as if the bake isn’t enough of a treat! BakedIn do like to make you feel valued, so these treats are such lovely gestures. In past boxes there have been tea temples and gourmet marshmallows. 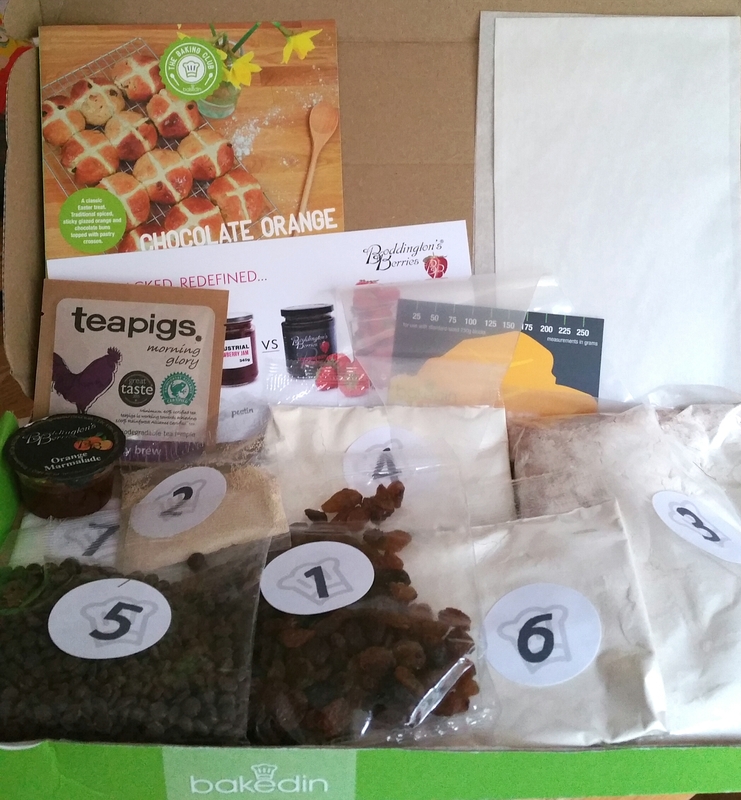 The May box had a tea temple from teapigs included as a treat. Mine was rooibos creme caramel flavoured, which won a Great Taste award in 2014. You could see little chunks of caramel in among the tea leaves! I have to say I loved this tea so much. It was beautiful and sweet and the flavour was just wonderful. I saved it until the house was empty and the dog was having a nap. Tea like this demands your undivided attention! If you fancy trying the BakedIn Baking Club for yourself, it costs just £7.99 per month which includes delivery! It really is great value. 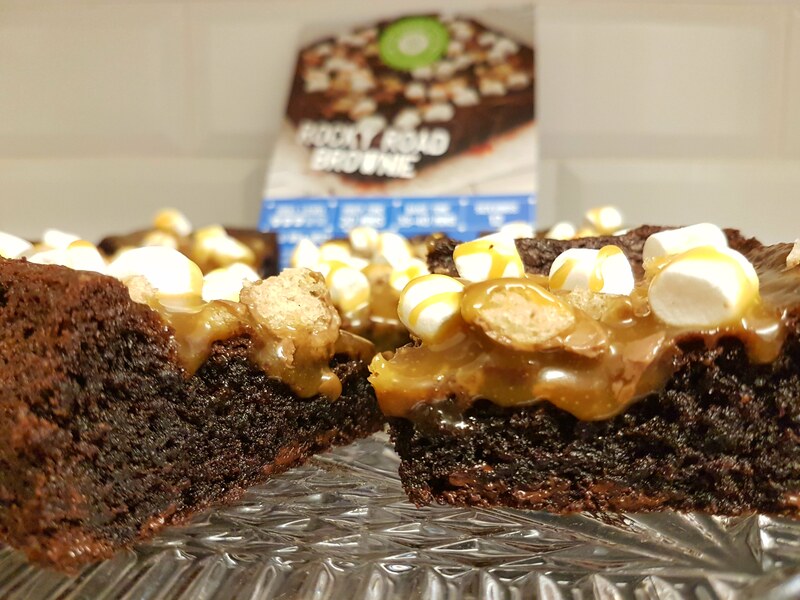 BakedIn also appreciate that it can be frustrating when you sign up to a subscription box as you often have to wait almost a month to receive the first one, depending on when you signed up. 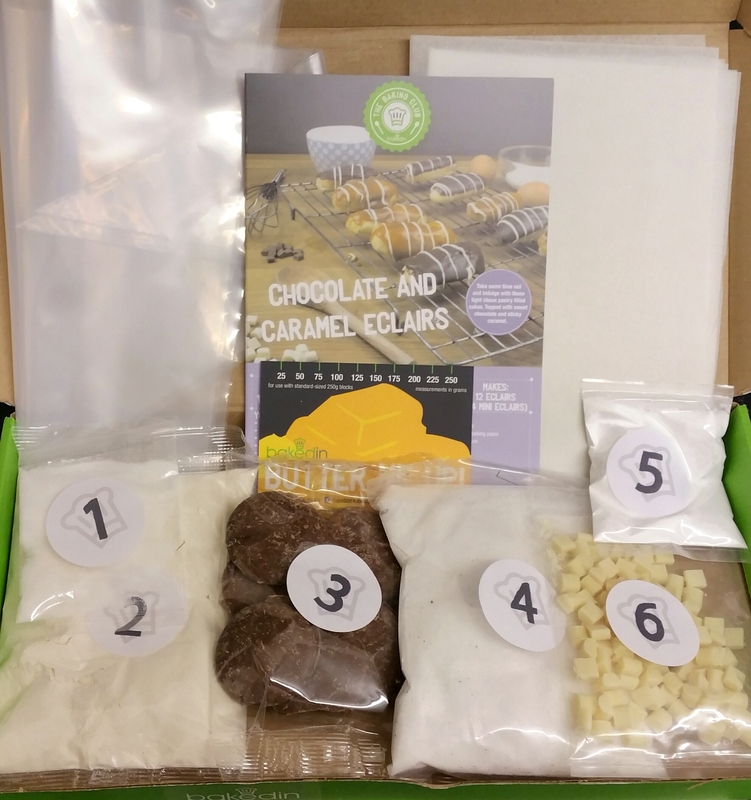 To get rid of this annoying factor, when you sign up with BakedIn they send you a fantastic kit straight away to get you baking within 5 days of joining. This first kit is for double chocolate whoopie pies and it is absolutely scrumptious! You then receive the next box at the same time as everyone else, and every month after. BakedIn recently started a Baking Club group on Facebook too, which you can only join if you are a subscriber. The group is fantastic! 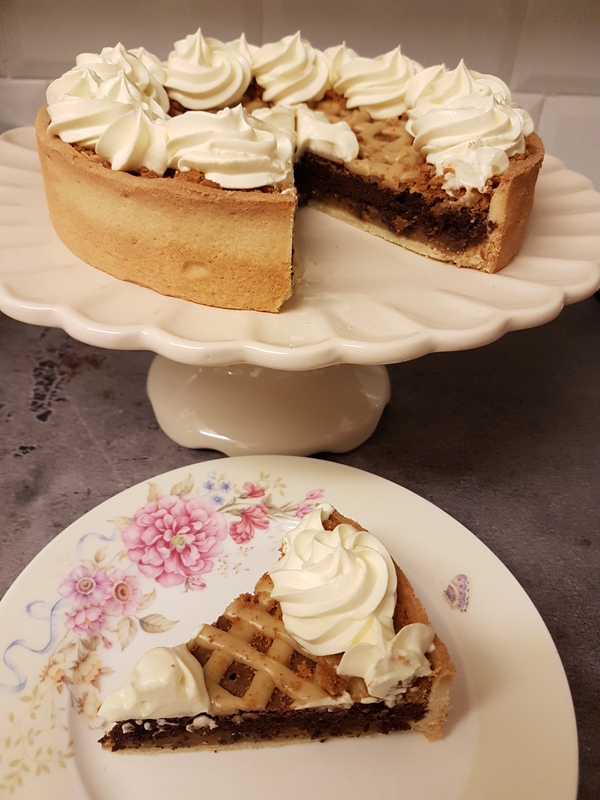 You can share photos of your bakes, ask any questions you might have… everyone in the group is so friendly and supportive. Special offers and discounts sometimes pop up in there too so it’s well worth joining! DISCLAIMER: I pay fully for my subscription and BakedIn don’t ask me to write posts for them. I choose to though as it is a subscription I highly recommend and a company I love. All views and opinions are my own. 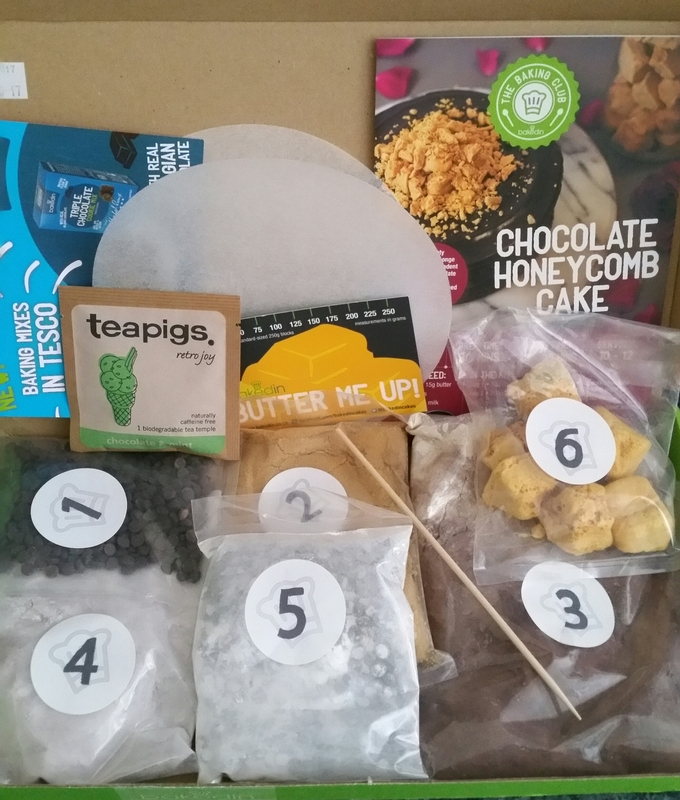 I was ridiculously excited when I opened April’s BakedIn Baking Club parcel. I absolutely LOVE eclairs, and in this box there were all the dry ingredients needed to make eclairs with 2 different toppings, caramel and chocolate. 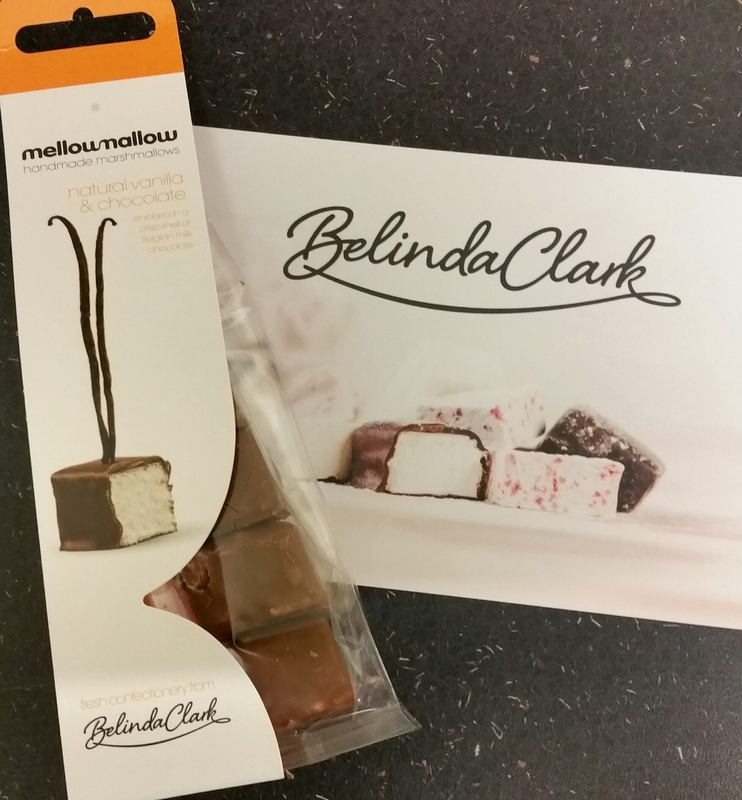 Also included was the brilliantly detailed recipe card, butter measure, piping bags, baking paper, and an extra special treat… some delicious vanilla and chocolate gourmet marshmallows from Belinda Clark. These were simply beautiful. Soft, light and fluffy just like a marshmallow should be, and then coated in yummy chocolate. Heaven! There must have been a marshmallow monster hiding in my house though as I only managed to have one and the rest mysteriously vanished! My son assured me he hadn’t seen anything suspicious but it was hard to get any sense out of him as his cheeks were all puffed out and he was unable to talk properly for some reason. His condition disappeared on its own after a few minutes but the marshmallow mystery remains unsolved. As some of you may know, I had a major kitchen disaster a few weeks ago, and I don’t mean burning a cake! To cut a long story short there was a terrible leak from pipes under the kitchen which destroyed the floor and the base cupboards, so everything needed to be ripped out and a new kitchen fitted. This all took a lot longer than I was expecting, so obviously baking went out of the window for a while. 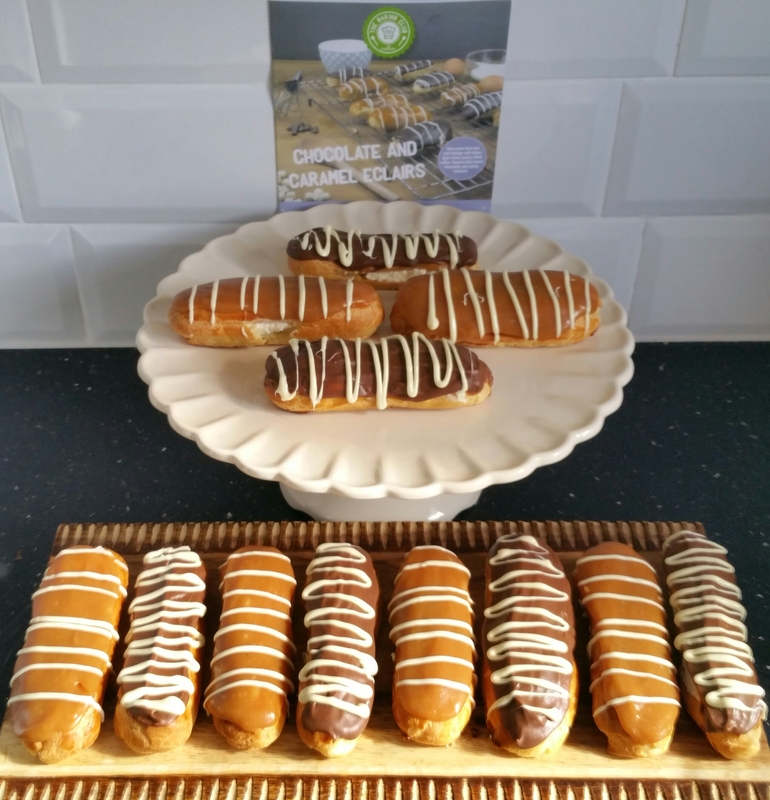 The BakedIn kit arrived on the day the kitchen was completed so I couldn’t wait to get on with making the eclairs! I was a bit nervous as I wasn’t sure how the new oven would be but it went like a dream. The recipe card said you could make 24 mini or 12 large eclairs. I opted for the large! 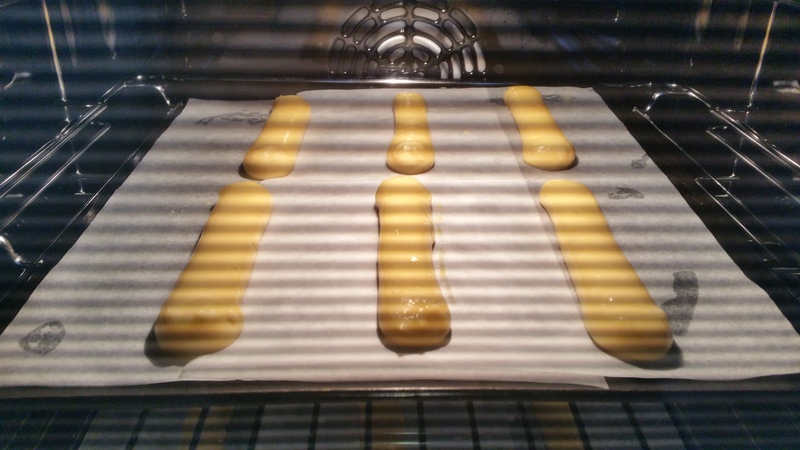 I have made choux pastry several times before but this recipe had an extra instruction before putting them in the oven that I had never heard of in other recipes – an egg wash on the raw pastry. It is a tip I will be using every time I make any from now on though as they developed a gorgeous golden colour with a lovely sheen. I left them in the oven a couple of minutes longer than the recipe said to make sure they were dry enough not to deflate, and then let them cool on a wire rack. While they were cooling I made the toppings. The chocolate was easy as I have made ganache many times. Caramel scares me slightly as it can go wrong so easily. I thought mine had if I’m honest. I followed the instructions but it just didn’t want to thicken enough to use, so I popped it in the fridge for a bit. Luckily it thickened beautifully in there! 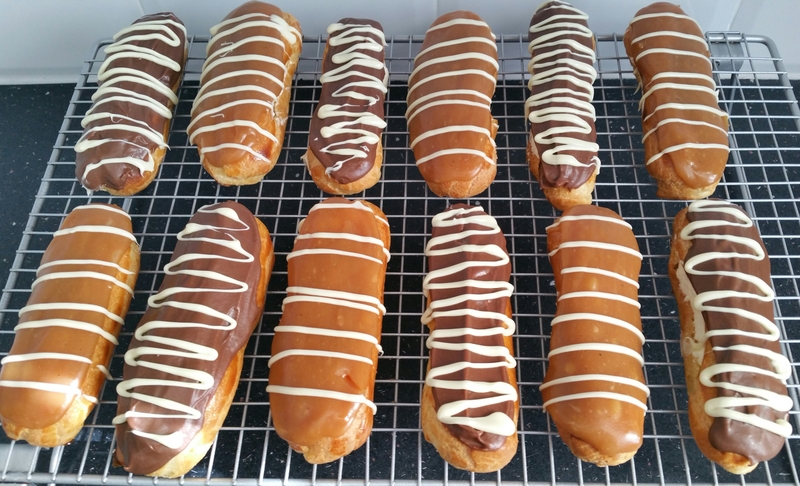 After filling the eclairs with cream and spreading the chocolate and caramel on top, the final stage was to drizzle them with melted white chocolate for extra indulgence. I have loved every single recipe that BakedIn Baking Club have sent, but this one disappeared faster than any of the others so far. 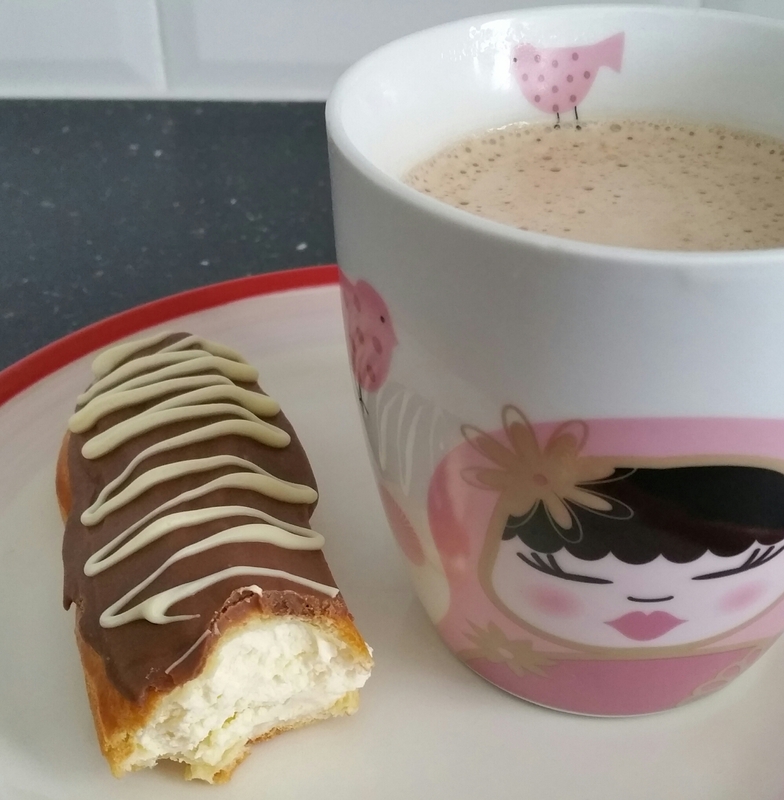 The finished eclairs were the best I have ever made, and this is the only recipe I will use in the future. The recipe cards you receive with the kits are so well-written and easy to follow, and each stage has a photograph so you can see you’re on the right track. To make them even better, they are all exclusively created for BakedIn by Michel Roux, and he includes a Top Tip on every recipe card to either enhance the recipe further or to make things easier during the bake. The fact they are created by such a world-renowned chef tells you they are going to be amazing! The Baking Club subscription costs just £7.99 per month including delivery, and is perfect for yourself or to give as a gift. You can cancel at any time, but I highly doubt you will! If you would like to try it, click HERE to go to the BakedIn website and find out more. 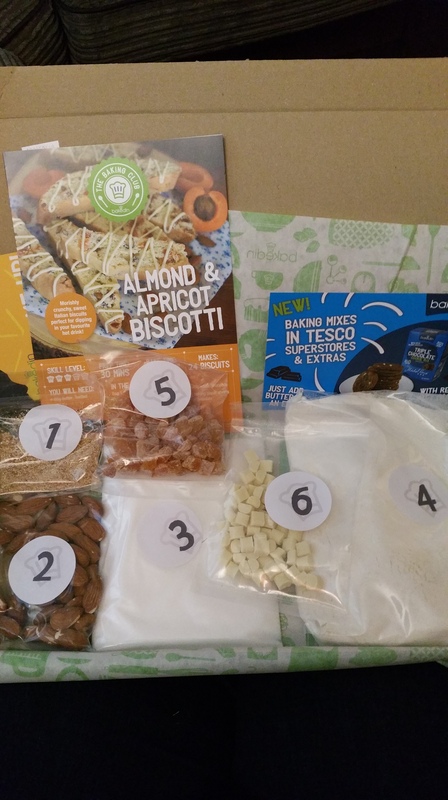 I really look forward to receiving my BakedIn Baking Club kit each month. My heart skips a beat when I see the long green box on my doormat. 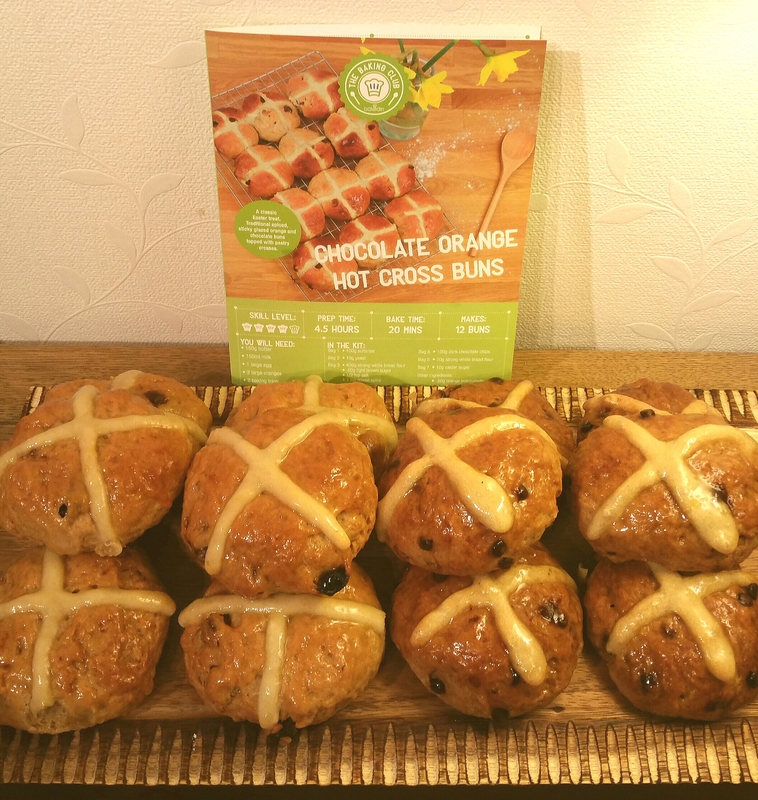 The March box was a perfect recipe for Easter… hot cross buns. They sent all the dry ingredients for you to either make traditional or chocolate orange hot cross buns. As well as the packets of flour, sugars, yeast, spices, sultanas, chocolate chips etc, they also sent a butter measure (as always), a piping bag, baking parchment and the easy to follow recipe card. Last month they sent a tea temple from teapigs which I loved, so I was very happy to find they had sent another one in this box too! This time it was their Everyday Brew and it was so refreshing. Perfect to start the day the right way or as an energiser mid-morning with a hot cross bun 🙂 This tea is extra special for another reason, apart from the fact it tastes so good. Most of their tea comes from Rwanda, a country that unfortunately still has a stigma attached to disability. Teapigs fully funds one house (the teapigs house) which provides specialist care and accommodation for children and young adults with disabilities, and they also send donations to other similar houses and to help with the costs at the UCC Children’s School, a school which has over 500 children (52 of them with severe physical or learning disabilities). Every time you buy a pack of the teapigs Everyday Brew, they donate some of the money to these extremely worthwhile causes. So you get a cuppa that makes you feel good in more ways than one! The kit also included a little pot of Boddington’s Berries orange marmalade to use as part of the glaze for the buns. The citrus smell as I peeled back the foil top was just beautiful! And it tasted as good as the smell suggested. I had never made hot cross buns before so was excited but nervous about making these. I knew with BakedIn though every stage of the process would be explained brilliantly, and the end results would be scrumptious. I was right. The hardest part of the whole thing was the waiting while the dough proved. The recipe involved kneading the dough by hand, but I’ve had a bit of a kitchen nightmare which has meant I haven’t had much worktop space, so I used my stand mixer to knead mine. I followed the rest of the recipe exactly. I was so impressed with the resulting buns! We all tried each of the flavours and couldn’t decide which we preferred. They were both delicious. It was really good to have the chance to try a different flavour to the traditional ones too. They were so soft and light yet so so tasty. BakedIn continuously impress me with their recipes and their attention to detail. I have recommended them to so many people as they are such a fantastic club to be part of. I get so excited when the middle of each month comes round. I have 3 subscription boxes arrive then… one for craft, one for cake decorating, and one for baking. The baking one, as regular readers will by now know, is the utterly fabulous BakedIn Baking Club. Each month this subscription sends a box full of all the dry ingredients and little extras you will need to create a stunning recipe created exclusively for the Club by world renowned chef Michel Roux. February’s box was the most indulgent one I’ve received so far. Every month I am so impressed by the recipe provided, and the ingredients included are always top quality. The recipe was incredibly easy to follow, as always, and a huge bonus with this month’s was getting to lick the bowl at the end! I could happily have eaten the cake batter raw it tasted so good! But the end result cake was just divine. So indulgent. 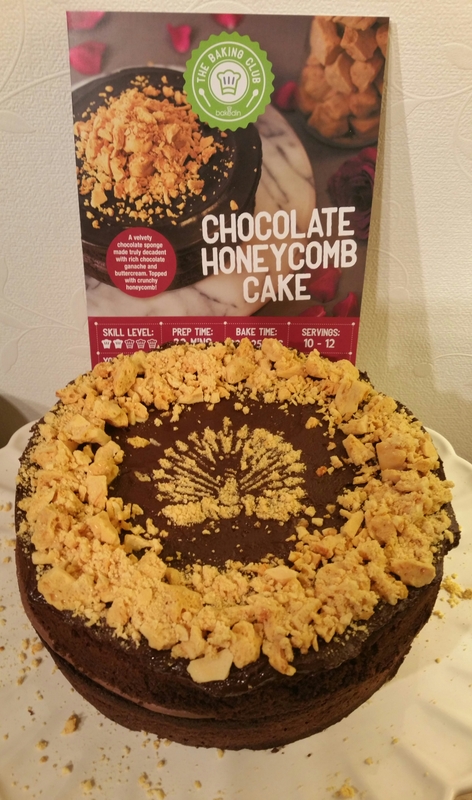 Beautiful moist chocolate cake, with fluffy chocolate buttercream inside, chocolate ganache on top, and gorgeous crunchy honeycomb to add the finishing touch. Each month Michel Roux gives a tip on how to further enhance your bake, and this month he suggested crushing up the honeycomb and using it with a stencil to make a pretty design on top. I decided to use a peacock stencil (random I know) and decorated the top of the cake with that. I loved the effect the crushed honeycomb made. Overall I was massively impressed with this cake and will definitely be making it again. Luckily the recipe cards are wipe clean so can be kept in perfect condition forever! The February box had an extra little gift inside to enjoy… a wonderful Chocolate and Mint tea temple from Teapigs. This was just beautiful. It was like drinking an After Eight mint! There was even a card with a discount code to use on the Teapigs website. I will definitely be taking advantage of that! 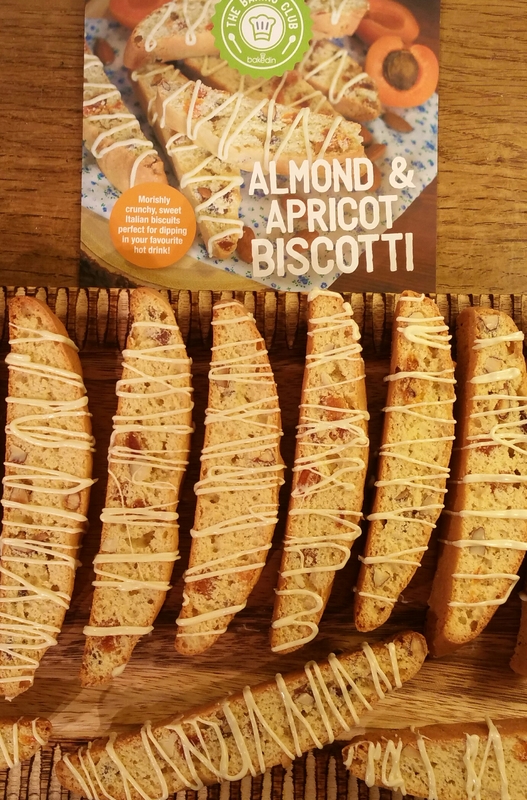 If you would like to try the Baking Club for yourself it costs just £7.99 per month which includes delivery. It comes in a box perfectly shaped to fit straight through your letterbox so you don’t have to wait in for it to arrive. BakedIn have an offer on at the moment though which lets you try the first box for just £4.99! 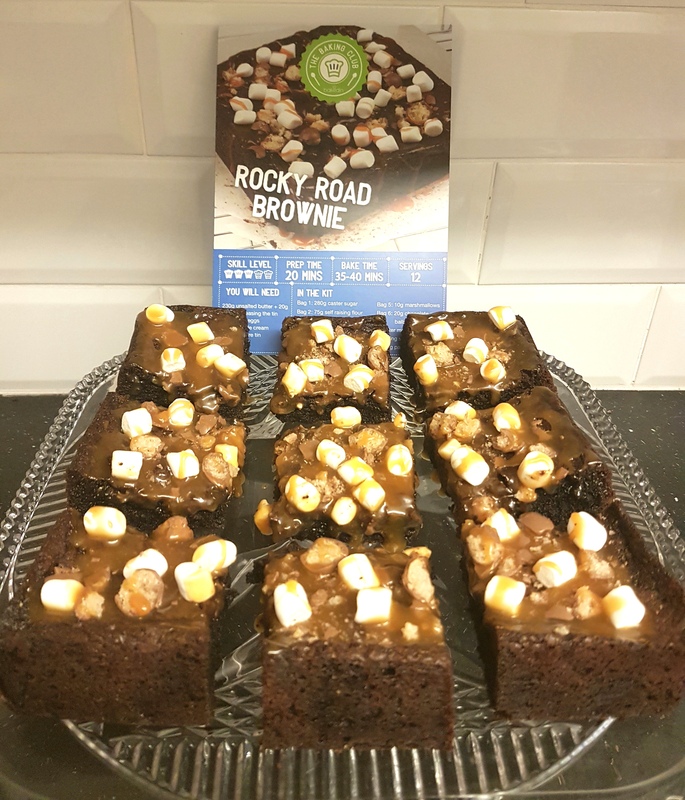 Click HERE to go to the BakedIn website and enter code TRY499 at the checkout, and you will receive your first box a few days later for the amazing price of £4.99. Happy Baking! I’m a firm believer in starting as you mean to go on, and the New Year started wonderfully thanks to BakedIn Baking Club. Every month they send a new recipe kit for you to make, and the recipes have all been created by Michel Roux exclusively for BakedIn. What I particularly loved about the January box was that, like the previous month, it contained a recipe for something I have always wanted to bake but never got around to doing. 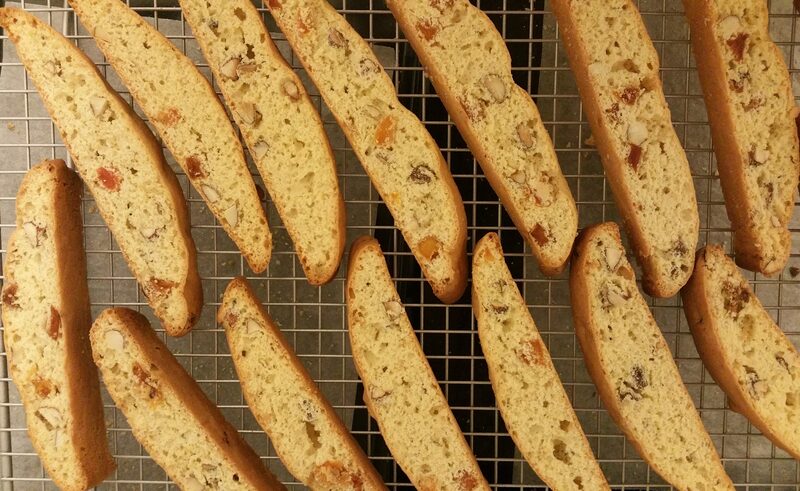 I’d actually imagined biscotti was a tricky delicacy to make, but this recipe proved me wrong. The box, as always, contained all the dry ingredients needed for the recipe. If more than one dry ingredient needs to be added at the same time, they pack those together in one packet for convenience. You might look at the box and think there were only 6 dry ingredients as there are 6 packets, but some of those packets had a few things in. This makes the baking process so much easier, having everything pre-weighed for you. BakedIn even include extra bits you’ll need such as baking paper or a skewer to test something is baked throughout. It’s the little touches like those that shows how much they care. They make sure you have absolutely everything you could possibly need, and they pack it all in a sturdy box which fits perfectly through your letterbox. Obviously for food safety reasons they can’t send eggs or chilled ingredients but they are easy enough to buy, and most people will already have them in their kitchen anyway. Anyway back to the biscotti. I followed the recipe card and was really surprised at how easy it was to make them. The nutty aroma that filled the kitchen was just so comforting. This is how they looked after their first bake and before cutting. I was already happy with it at this point as it looked pretty much how it was supposed to. Phew! 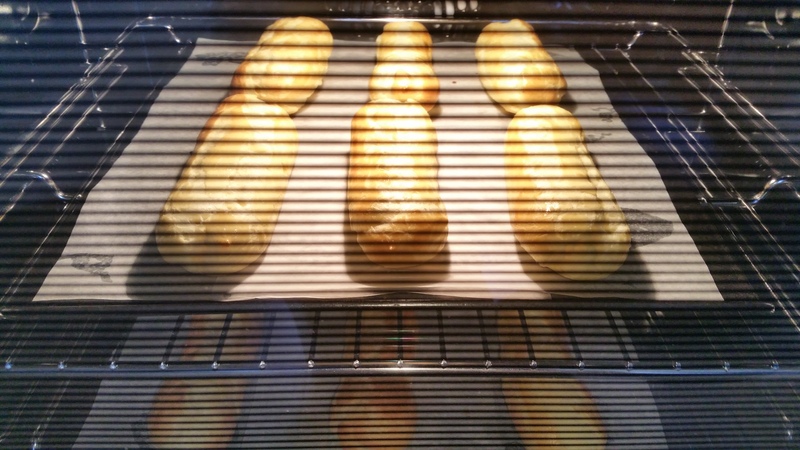 I’d had visions of mine spreading off the baking sheets and dripping all over the bottom of the oven, or rising too much so their shape was wrong…. I told you I thought it was trickier to make than it actually was!!! 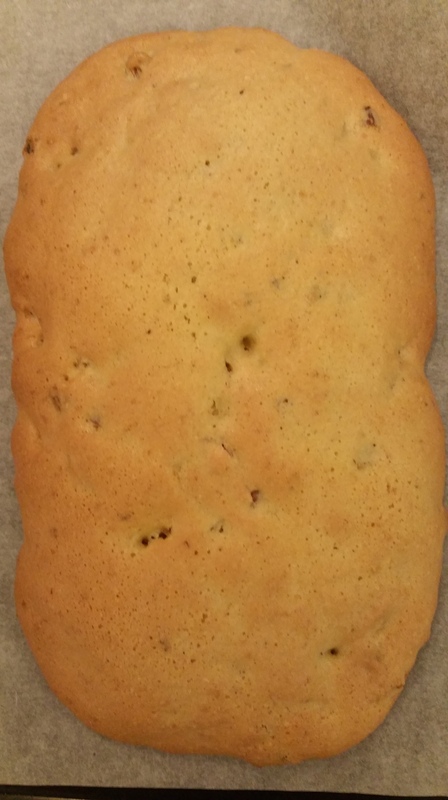 I sliced each into 1 inch slices and returned them to the oven to get that crunchiness that biscotti is known for. At this point I was sat nervously on the kitchen floor in front of the oven, watching to make sure I didn’t burn them! I needn’t have worried, and now I know for next time that I don’t need to keep my eye on them! 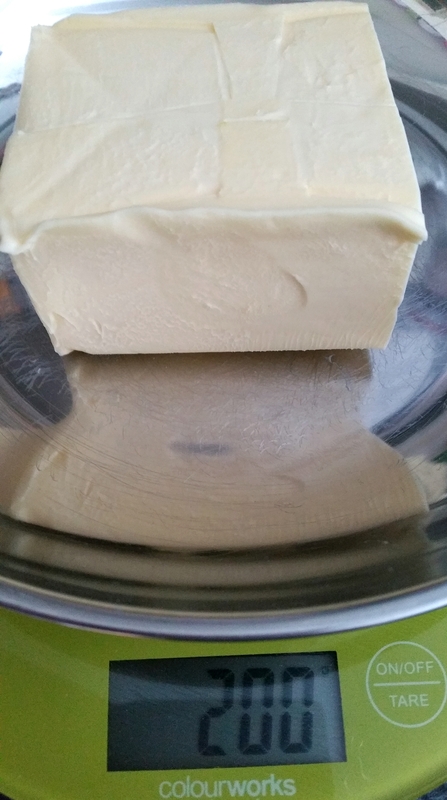 The final stage was to drizzle white chocolate over them. This made them look extra indulgent and scrumptious. They were delicious dunked in a cup of coffee. That made them literally melt in your mouth. They were equally good on their own though. This is yet another wonderful recipe from the Baking Club which I will be making again and again. If you fancy joining the BakedIn Baking Club, it costs just £7.99 a month including delivery, and you can cancel at any time. Your first box is sent within a few days, and then your next box is sent at the same time as everyone else’s. I love the fact you get a box almost straight away. Most other subscription boxes make you wait until the next box is due, and if you’ve just missed the deadline for that month it can be a long wait for your first one! BakedIn understand you will be keen to get baking, so make sure you have something to get on with. 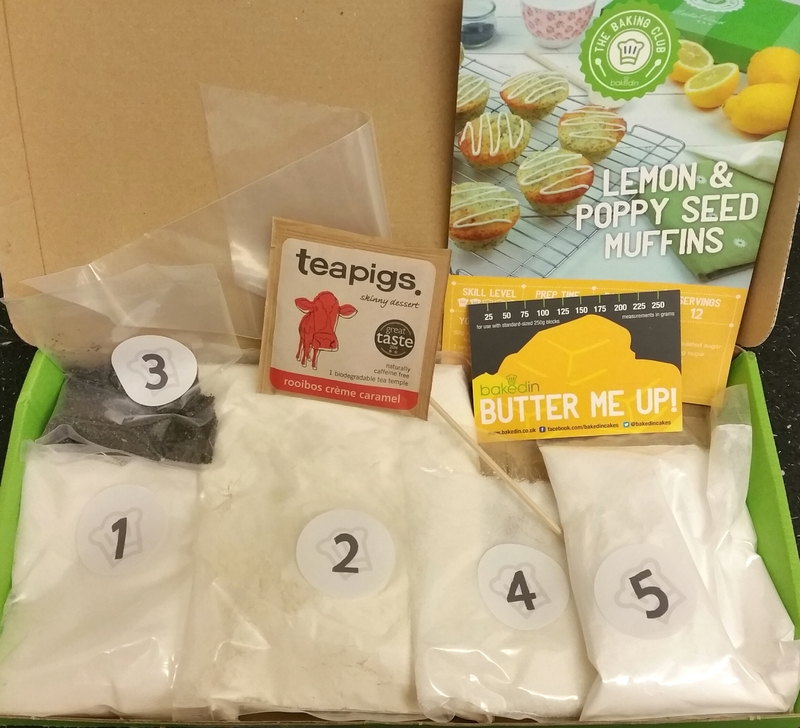 BakedIn are running an offer at the moment to give you your first box even cheaper! If you click HERE and enter the code TRY499 at the checkout, your first box will be just £4.99 including delivery. Definitely worth a try! Happy Baking! DISCLAIMER: BakedIn don’t ask me to provide a review nor do I receive any form of compensation for my posts. I pay fully for my subscription and like to share the details of them with you as I truly think the Club is a wonderful subscription. All views and opinions are my own. As you all know, I have been a member of the BakedIn Baking Club for a while now and it never fails to impress me with the recipe each month. December’s box really really excited me! Shockingly I had never made a gingerbread house before, so as soon as I opened the box and saw an array of sweets and the recipe card I let out a little happy squeal. I had visions of Hansel and Gretel and an instant Christmassy feeling swept over me. I hadn’t been feeling particularly festive until the arrival of this box, but this really changed that! 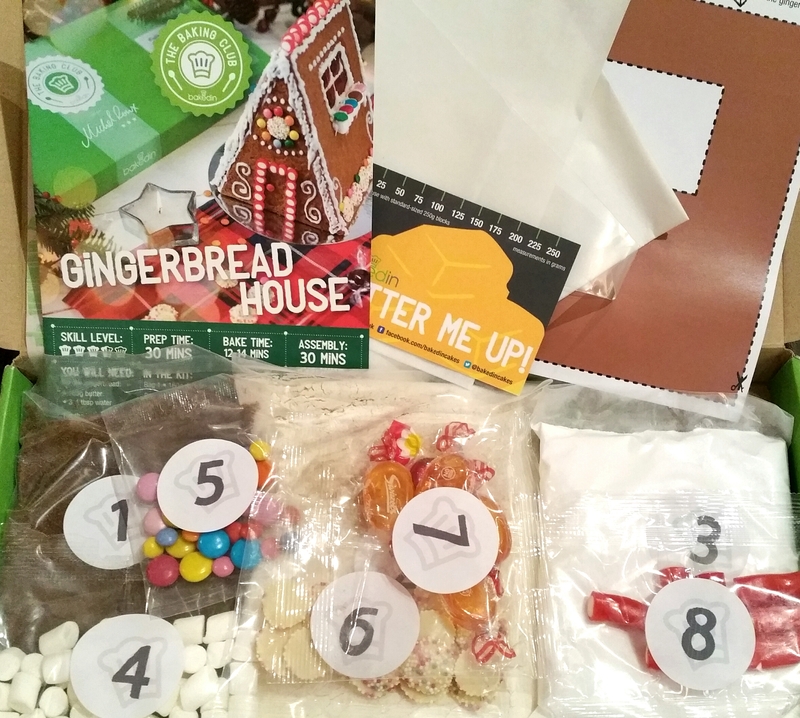 The box contained the recipe card, lots of different sweets, all the dry ingredients needed for the gingerbread and the icing, a butter measure, baking paper, and templates for cutting out the shapes needed to construct the house. As you can see, each packet is clearly labelled with a number. This makes following the recipe so much easier and makes it ideal to do with children. My 9 year old son Luke couldn’t wait to help me with this one! 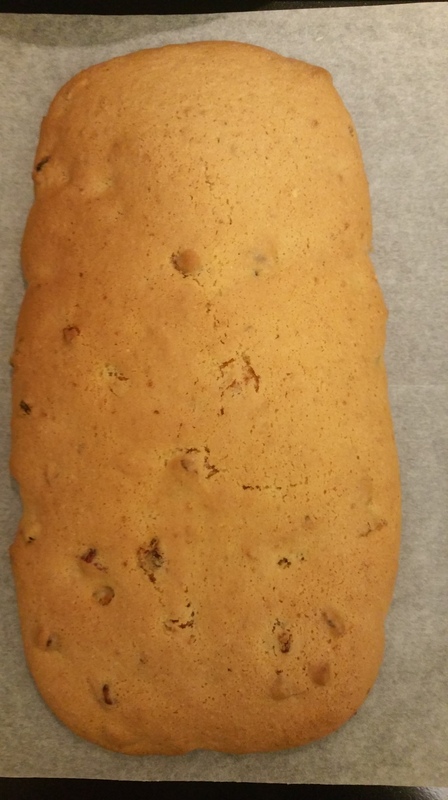 After watching some episodes of The Great British Bake Off I was a bit nervous that my gingerbread would collapse, as that seemed to be a common problem with some bakers. I needn’t have worried. Baking Club recipes are created exclusively for BakedIn by Michel Roux, so it goes without saying that they are perfect. No chance of collapse with this recipe! Making the house with Luke was one of the highlights of the Christmas holiday. He loved decorating it most of all. The only trouble was he loved the end result so much he wouldn’t let us eat it for ages!!! Luckily it still tasted amazing when he finally agreed to breaking it up. The house had stained glass effect windows which looked stunning when we placed a battery-operated tealight inside the house. We did originally use a little torch but the tealight looked better. Luke said it was as if there was a fire glowing inside. There might not have been a real fire but there was a definite real feeling of warmth and happiness from making this recipe. 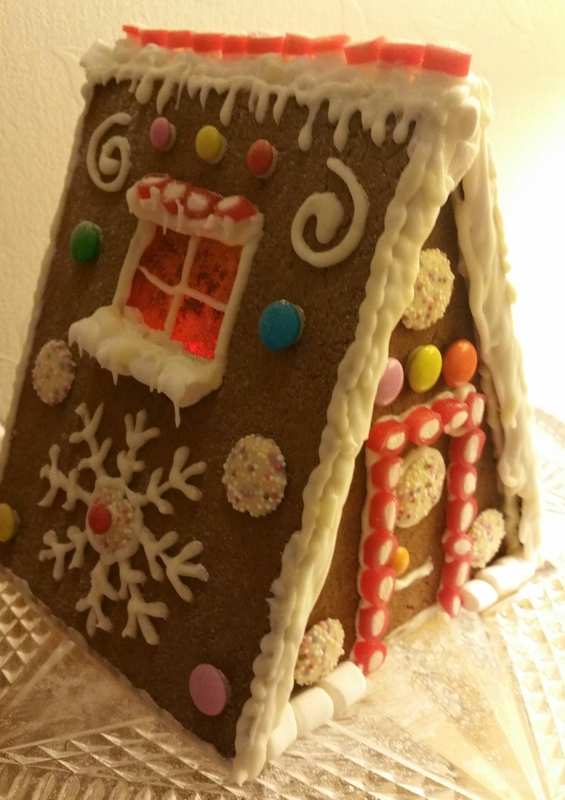 In fact, we enjoyed it so much we decided that we will make a gingerbread house every Christmas from now on. You really can’t beat the contentment that baking with your family brings. BakedIn Baking Club is a club suitable for everyone. People who have never baked before or who are just beginning to bake will love how easy the recipes are to follow. The recipe cards have photographs of each step so you know you are on the right track. The ingredients are already weighed out for you so you don’t have to spend ages doing preparation. All the dry ingredients you will need are included so you don’t have to buy a big bag of something you might not need again for a while, meaning less waste. People who are regular bakers will enjoy being able to add the scrumptious recipes to their own repertoire. It costs just £7.99 a month to be part of this wonderful Baking Club. That price includes postage so it is amazing value for money. If you are interested in joining it too, you can have your first box for just £4.99! To get your first box for £4.99 click HERE to go to the BakedIn website and enter code TRY499 at checkout. Happy Baking! DISCLAIMER: I pay for my subscription and receive no compensation for writing reviews for them. All views are my own honest opinions.